Monday 14th March. It was just perfect, 1’10” 42 degs squeaky clean, calm, mild even warm by 10.30am, new rods on who were keen as mustard, thrashed the beat to a foam and we never had a touch, not a bloody pull. 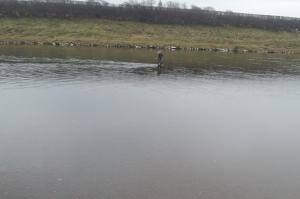 There was a fish seen in the Slap this morning and a fair sized Kelt this afternoon in the Cauld apart from a couple of brown trout rising there was no more piscatorial activity on the Lees today. I did see a couple of bumble bees and the daffodils are just about open so all in all it was a nice day apart from the lack of fish. 7 fish reported across the websites, nearest to us was 1 at Upper North Wark. Tuesday 15th March. It was a different day today down on the Lees with a cold east wind and dull skies all day, the lads were no less keen though and set about their task with enthusiasm. I took Chris out in the Cauld for a float about and we saw two fish but touched neither. Brian Perry Lees regular lost a good fish down at the Iron Gate and that was it for the day apart from a brown trout out of the Glide, two moles and a weasel made up the bag, the weasel was in the trap right next to the chicken hut pop hole had he made it in he would have killed the lot as they are rescue hens and would just sit there until it was their turn to get bitten to death. There were 23 fish across both sites the closest to us being South Wark from the Temple stream where Andy Brittan managed to catch a bonsai salmon 5lb soaking wet (not that I’m jealous) and downstream there was one at Ladykirk, its always nice to hear about fish getting caught below us, sort of lets you know their still coming and slowing down a bit. Wednesday 16th March. Another cold damp day with east winds, not for the faint hearted, 1’9” and 42 degs squeaky clean. Chris Elcock was nearly the lucky boy getting two fish to the beach in the Middle stream and losing them both he also had another good pull, that’s about as unlucky as it gets in the spring when there aren’t that many fish about. All three bits of action were in the last 10 yards of the middle stream and that was the only action for the day. We did see another fish in the Cauld but couldn’t entice a take from it. The catches on the river are nothing to shout about unless you happened to be fishing around Sprouston or Hendersyde where they seem to go from strength to strength and well done them. We had a visit from a pair of redshanks today, there the first I’ve seen this year, sandmartins next. Tony Rodden from Jedburgh after a wee bit of tuition is now putting out a line that resembles a laser, so much like a laser in fact that two flights from Newcastle airport had to be diverted this afternoon as the pilots were being dazzled. So the bag for the day was 1 Carrion Crow and 2 Moles carried over from yesterday. Thursday 17th March. I’ve just about had enough of this country, the weather girl smugly told me tonight it was 19 degs in Braemar today, thats right bloody Braemar, whats all that about? We were sitting in 5 degs as we have been since Monday, it’s not good enough, I’m starting to get that seasonal acquired syndrome thingy from a lack of sun and living in a grey world. 1’8” and 42 degs calm but a bit of an east/north air. Kevin Campbell and pals here for the day and up onto the Slap croy was Ali Sutherland who managed to shake off a heavy fish on his fourth cast of the day, it took a wee bottle tube tied black and purple on a 10’0” sinktip. That was the only touch of the day, there were a few fish showing in the Slap this morning 2 or 3 if I tell the truth but in early march thats a major run going through. 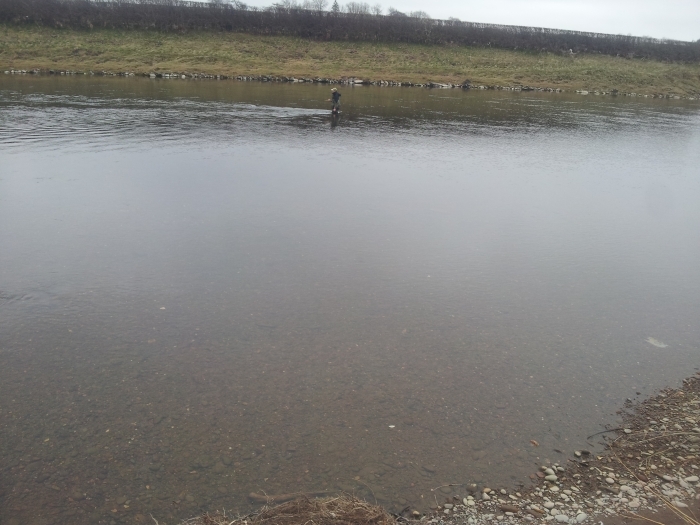 This afternoon down at the back of the wall Ali was wading down and was almost touching the far bank with his rod tip and he was just above his knees (see photo) so more gravel in there. The forecast according to Miss smug on the telly is the grey world to continue for the next 10 months, so that’ll be nice. 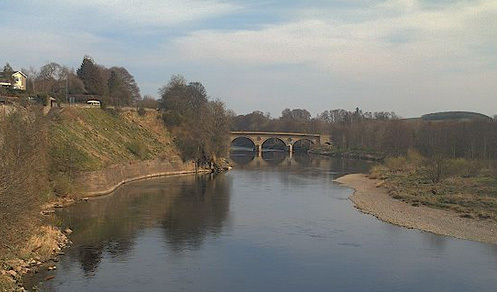 Any fish caught near the Lees I hear you ask, Tillmouth and Birgham Dub were the closest. Highlight of the day was Mick Charlton Ghillie at Middle Pavilion reporting his first fish of the season, so well done Mick and about bloody time. Friday 18th March. Another dull cold day with a north air about the place to add to the gloominess, but we had a new team on so the company was good. 1’7” and 42 degs, same as yesterday really. Neil Andrews fresh back from New Zealand where he was catching brown trout that wouldn’t fit in any frying pan fished the bottom end and blanked, good friend Steve wobbled his way through the Glide and Iron Gate only stopping for a coffee break and to warm his fingers by the campfire I had going, the only thing missing were the toasted marshmallows and the salmon of course. John Leighton and Neil Wilson were on the top and also blanked but John hadn’t wasted his morning as he fine tuned his casting style, we didn’t see a fish or have a touch all morning. This afternoon after a nice lunch the two teams swapped places but the result on the scoreboard stayed the same, John however found out that he needs to tweak his casting style a bit more as a snap “T” crossed with a circle “C” in an downstream wind off the right shoulder when fishing the left bank doesn’t work and results in a trip to the local health centre to get the hook removed and the cut in his cheek super glued together, another case for barbless hooks as they come out nice and easy. Saturday 19th March. I had an enforced day off today with a very painful back, so sore was it that had I been living on my own I would of been stuck in bed all day, I couldn’t even get dressed this morning, wives do have their uses. Another grey day 1’7” or there abouts but a fish was caught. Neil Andrews was the lucky boy getting a fresh 7lber from Learmouth stream; Flipper on the other side also had a fish today getting them on to the scoreboard for the first time this year, there were only another 3 fish reported across the websites today which is shocking but at least they were all down this end of the river. (Sorry if you’re fishing above Kelso) The other Lees fish came from the lower cauld this evening. I’m just back from the physio and he’s really helped my back but I’ll be taking it easy for a day or two. It shows how few fish were there today when even Andy Brittan fresh back from his annual trip to Argentina couldn’t catch anything, I was sorry to miss him today as he’d brought down the trophy he won in a tango competition to show me, next time Andy.